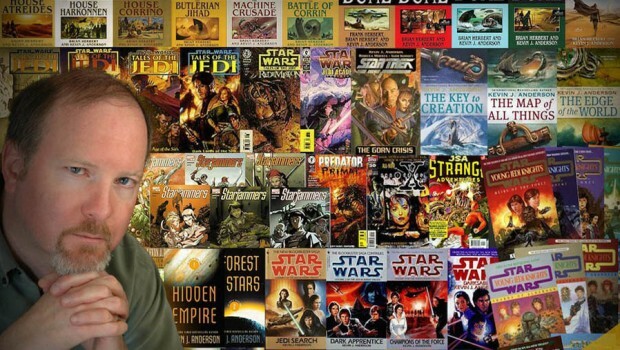 Kevin J. Anderson is one of the titans of epic science fiction literature. After the bestselling Saga of Seven Suns and 11 novels set in the Dune universe, he has now embarked on a new SF series, Hellhole, with his Dune universe co-author Brian Herbert. “This is just the best job I could imagine doing,” he tells Matt McAllister. Was Hellhole inspired by any particular idea or historical event? It’s somewhat based on the great American land rush, where half the continent was opened up for new settlers to stake their claim. In Hellhole there’s a bunch of minimally-mapped planets that have just been turned loose for the colonists to go out there. The planet Hellhole was struck by an asteroid several hundred years before the story begins: it wiped out the local environment and wrecked the local eco-system, so it’s a nasty place. Therefore only the real dregs go there – the misfits, the religious fanatics, the outlaws; the people that have nowhere else to go. It’s ruled by a deposed rebel general who’s been sent there in exile – he’s somewhat like Napoleon. In our book the general is the good guy, because the government that they’re fleeing from really is corrupt – and he’s the one who can keep colony surviving. There was a previous alien civilisation on the planet, which was wiped out by the asteroid impact, and our misfits and outlaws keep finding remnants of it. Again, it’s a reflection of the history of the American West, where they would exile Indian tribes into terrible reservations in the desert, then as soon as they discovered oil on that land, they wanted it back. So there are reflections of that kind of history – but it’s set against the backdrop of a giant science fiction story. Hellhole marks the beginning of another series. Do you prefer doing epic series than standalone novels? It depends on the size of the story. I mean, you don’t want to have a story that can only carry one book and then stretch it out to three. I also have my Saga of Seven Suns: seven 600-page novels, which I plotted from the very beginning. But that’s a giant story – I knew right from the start almost everything that was going to go on and that’s how long it needed to be. Hellhole will be a trilogy – we’ve got books two and three plotted. The first book introduces everything, people get into even tougher situations in the second book, and by the third volume it all comes to a culmination and, we hope, a satisfying conclusion. Using a story that’s as big as Hellhole or the Dune books or the Seven Suns books allows me to do snapshots of different facets of a conflict, from the highest leaders to the lowliest soldiers in the trenches, to the innocent peasants or bystanders that get trampled on. I just love writing books that give you room to tell all the different story threads. We try to keep track of all of the details, but we have to read and re-read the books so it stays in our heads as well. I mean, I wish I was more organised and had a giant encyclopaedic file system so I could look up something, but it’s mostly in our heads. As we write more and more books and my brain stays the same size it’s starting to fill up the available RAM! How do you go about co-authoring a novel? Is it good to have someone to bounce ideas off, or does it involve a lot of compromise? Well, you have to compromise, but it’s also very invigorating. Our ideas often form a great synergy. I might come up with part of an idea that Brian will riff off or vice versa – it’s often like a jazz performance! The best part of this one is that after 11 previous novels set in his father Frank Herbert’s universe, we’re now branching off into something that is our own creation. Other than Brian Herbert, I’ve collaborated with a lot of other authors, including my wife Rebecca [Moesta] – we’ve done 30 or 35 books together and have been married almost 20 years, so that’s worked out well too! Is it easy for you and Brian Herbert to write with ‘one voice’? We start off with a fairly similar writing style – straightforward, clean prose, colourful writing. It would be much more difficult for me to collaborate with, say, William Gibson, who has an extremely distinctive style. We split the books half and half, and choose which chapters we want to write – he’s interested in certain things, I’m interested in other things. So maybe I’ll do the villains and he’ll do the heroes, or something like that. Then, after we’ve written our drafts, one of us edits the whole thing straight through and cleans up the prose; then it goes to the other person who rewrites it straight through; and then it goes back to the first person. After five to 10 iterations, he’s eliminated anything that doesn’t sound like him and I’ve eliminated anything that doesn’t sound like me, so that when the reader gets to the book it should be fairly seamless. How do you keep the science so believable? I have a degree in physics and astronomy, and I keep up reading new scientific developments, so I have a background in science. But there are hard science fiction writers who do it differently and really get into the absolute cutting-edge of mathematics and quantum physics. That’s deeper and more scientifically accurate, but the more you get into stuff like that the more readers you’re going to lose. I’ve talked to a lot of die-hard science fiction readers who frankly have given up on a lot of science fiction because it’s too dense for them and they can’t relate to it any more. In my books I take the approach that I’m dealing with the characters who live in that universe. If you walked up to a random person on the street and asked them how an internal combustion engine works or how a satellite TV signal converts data into an image on your television screen, most people don’t know. And so my characters don’t necessarily know how an interstellar stardrive works or how a telepathic system of an alien race works. It affects them, and that’s what matters. Critics love to analyse the politics behind science fiction novels. Do you ever set out to make any kind of political statement or social commentary? I do but I think first and foremost you have to tell a good story – if no one reads your book then you can never get your point across. Predominant in the planning and writing of the book is that it has to have the basics of interesting characters, a fast-paced plot and great settings. If that’s all that people get out of it, then it’s still a success. If I can also put my own feelings on the causes of war or political conflicts then that’s there as an underpinning. But you can’t walk around with a sign in front of the reader saying, “Here’s my point, here’s my point!” You have to deliver it a little more subtly, and the way you can get your message delivered is by carrying it on a very interesting story. I always read them both – I think I read Lord of the Rings and Dune in the same year when I was 12. Boy, that was a great year! They both involve writing imaginative stories that aren’t set in the world that I’m living in, and they have different sets of rules. In one universe the rules are science; in the other universe the rules are basically history and magic. Now in the Terra Incognita books, it’s really more history with minimal magic. My research was into the Age of Discovery, Prince Henry the Navigator, sailing ships, and nautical legends of sea serpents and the Kraken and Leviathan. But just like a science fiction epic, there are a lot of characters. There are lands instead of planets, there are fantasy races instead of alien races – I view them as very similar. I think the people who like reading Dune or Hellhole or Seven Suns would also like reading Terra Incognita because it’s the same kind of epic story, just a different backdrop. Yes, it’s my professional development to watch Star Wars and The X-Files and Star Trek! Do you ever find it restricting working in someone else’s universes? Well, I don’t think an author would be a good author if he found the entire Dune universe restricting or the entire Star Wars universe restricting. It would be like saying that you’re setting your novel in London, and then complaining that you can’t put a giant desert there because there isn’t a desert in London. I mean, if you set a novel in London there are certain parameters! It’s a slightly different thing to work in a property that’s already established and the fans already know and love. I enjoy doing both – I get to play with my favourite toys and I get to make up my own too. What authors or books have had been a big influence you? Dune was huge for me, Ray Bradbury was huge for me. And when I was younger I ran through piles of André Norton’s books – wonderful science fiction adventures! More lately, and you can probably tell in the similar stuff that I do, I very much enjoy the giant epics of Alastair Reynolds, Peter F. Hamilton and Stephen Baxter. Oh, and Dan Simmons’ Hyperion books. I get to read too, not just write! How do you think your writing has evolved over the years? I hope that it’s improved – I mean, if you’re writing 100 books you don’t want to get worse! I keep trying to stretch myself and do something that’s more complex and more vivid and more emotionally satisfying with each book. I try to make the plotting more complex – I don’t just want to write the same book over and over again, because that would be dull. Sometimes, when I re-read my earlier books, it surprises me. Because with some I think, “Wow this is really good, did I write that?” And others I think, “Oh, that needed another edit.” But at the time it was the very best I could do. I think the easiest way for a writer to see when he’s doing something wrong is to publish something and then read it. Because you never notice it before it’s published! Are there any movie versions of your books in the works? I’ve had a few things optioned, but Hollywood is a more insane place than any science fiction universe I could imagine. I’m co-producer with Brian on the new version of Dune that is in the works with Paramount – but we just receive phone calls with updates once in a while and don’t know where that’s going. Other options come and go. But the process of making a movie… there’s so much money involved and so many people and decision makers, compared with a book being published. Just the other day we were getting an update on the Paramount film, and it was this long conversation with different convolutions of directors and screenwriters and executives; it was very difficult to figure out what was going on at the end of it. I’m very frank about the fact that it’s different skills writing a script and writing a book, just like it is being a brain surgeon and a heart surgeon. I know how to write books and how to tell stories, and that’s where my focus is for the most part. If someone wants to make a movie out of one of the books and manages to usher it through to production then I’ll be happy because it will increase my audience, but the books are what I do. You’re a very prolific author. What books are you working on at the moment? My wife, Rebecca Moesta, and I have a young adult series of books to promote interest in the US space programme called the Star Challengers. We got a cover quote from Neil Armstrong and Buzz Aldrin! Then there’s the third book in the Terra Incognita trilogy, The Key to Creation, which is out in June and which wraps up that trilogy. And Brian Herbert and I are about to go on a US tour for Hellhole, at which point we’ll be plotting the second book in that trilogy. We have also just delivered The Sisterhood of Dune. Hellhole is out now (Simon & Schuster). Photo: Sarah Thompson. Interview originally published on Total Sci-Fi Online.